Place sugar, oil, mustard, vinegar, garlic, lemon juice, lime juice and salt in medium bowl; whisk together until well blended to make marinade. Pour marinade into resealable plastic freezer bag. Add chicken; seal bag. Turn several times to completely coat pieces. Refrigerate at least 2 hours or overnight, turning occasionally. When ready to cook, remove chicken from bag, allowing excess marinade to drip off. Discard leftover marinade. Spray cold grill and cooking tongs with grilling spray. Position grill 4 to 6 inches from heat. Heat grill according to manufacturer's suggestion. Cook chicken over medium heat 15 to 20 minutes, to an internal temperature of 160°F, or until juice is no longer pink in thickest part. Turn frequently to prevent burning. 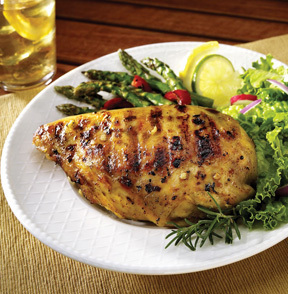 May substitute bone-in chicken breast or dark chicken for the boneless breast. Bone-in breast will need to cook 20 to 25 minutes, or until 160°F. Dark meat may need to cook up to 35 minutes.